Buddy Tuttle, age 95, of Aurora, passed away Saturday, January 27, 2018, at Westfield Quality Care in Aurora. Funeral Services will be held 10:30 A.M., Wednesday, January 31st at the Aurora United Methodist Church. Rev. Ron Harris will officiate. Interment will be in the Aurora Cemetery. Visitation will be from 5 - 7 P.M. Tuesday at Higby-McQuiston Mortuary. Memorials may be made to the United Methodist Church. Condolences may be e-mailed to the family through the mortuary website at www.higbymortuary.com. 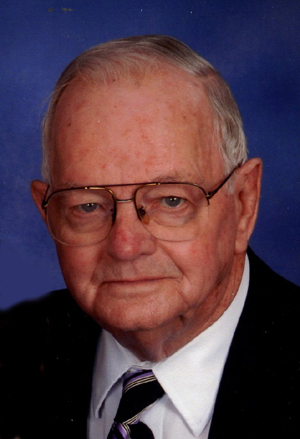 Buddy ‘Bud’ Lyle Tuttle, the son of Arthur and Elna (Flint) Tuttle, was born in Cushing, Nebraska, on March 10, 1922, and passed away at Aurora, Nebraska, on January 27, 2018, at the age of 95. Bud graduated from Marquette High School in 1939. He served in U.S. Army during World War II. He was stationed in the South Pacific for 38 months and was awarded the Purple Heart. Bud was honorable discharged on November 30, 1945. On June 5, 1949, he was united in marriage to Winona M. Blauhorn at Archer Zion Methodist Church. To this union they had three daughters: Linda, Connie and Kristi. Bud worked as branch manager for the United Coop in Marquette until 1985. He worked for 15 years at Higby-McQuiston Mortuary with his wife, retiring in 1999. They had been married 67 years. Winona passed away on February 2, 2017. Bud was a member of the Aurora United Methodist Church since 1985. He had been a member of the Marquette United Methodist Church for 26 years, where he had served on the church board and other various positions. Bud was a member of the Marquette Fire Department for 40 years, where he served as secretary and Fire Chief. He was preceded in death by his parents; wife, Winona, three brothers, Lloyd, Clarence and Vern Tuttle and two sisters, Ruth Morrison and Bessie Jensen. Those who remain to cherish his memory are his three daughters, Linda (Steve) Bjorkman of Lincoln, Connie (Bennett) Peterson of Marquette and Kristi Clymer of Omaha; 8 grandchildren, Jeff (Amy) Bjorkman, Eric (Kelly) Bjorkman, Matt (Leah) Peterson, Becci Peterson, Kevin (Andrea) Clymer, Jason Clymer, Nick (Rachel) Clymer and Shelby Clymer and 11 great-grandchildren. He is also survived by his brother, Don (Daisy) Tuttle of Marquette; sister-in-law, Fern Jacobsen of Lake Ozark, Missouri and brother-in-law, John Glause of Chapman and many nieces and nephews and other relatives and friends.